I took out the old range hood last year when I replaced a couple sections of drywall and painted the cabinets. Usually I like to reuse whatever parts and materials I can to avoid being wasteful, but the old hood was a nasty orangish-bronze color and had over 40 years of grease worked into every corner of it. After the cabinets had been painted and reinstalled, I just couldn't see the old hood being anything but an eye sore and decided a new one was the way to go. 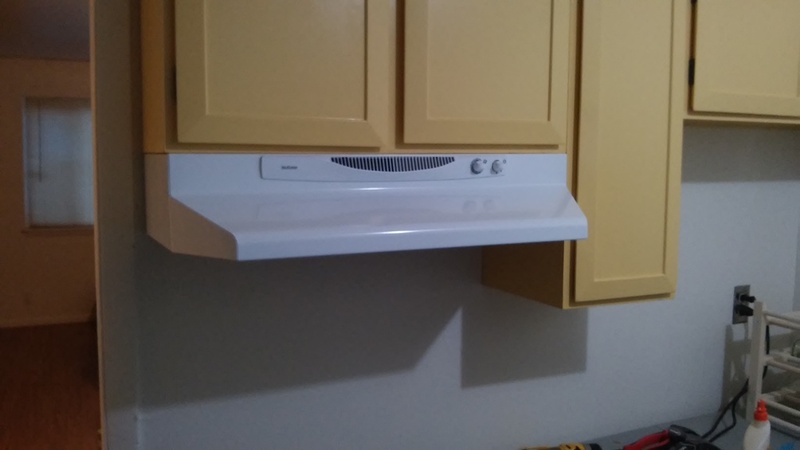 Well it turns out that range hoods don't always have their mounting slots in the same place. 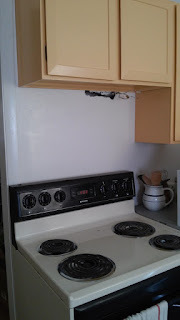 And even if they did, I'm not sure the old hood was installed properly for the cabinets anyway. 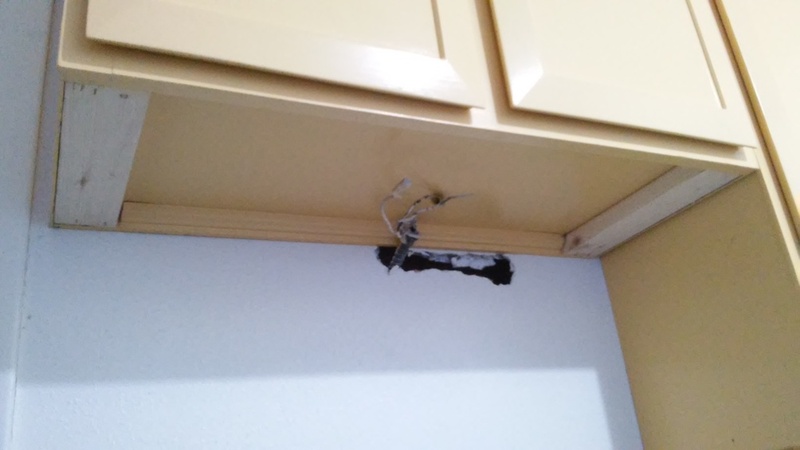 The old hood was screwed into the molding on the underside of the cabinet which didn't provide a flush surface for the hood to be mounted on (you can see one of the old screw holes painted over in the picture). 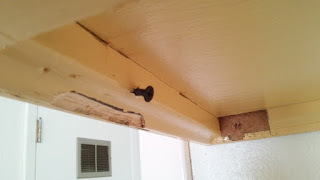 The old hood was made from some substantial sheet metal so maybe fudging the gap wasn't a big deal - it did last a good forty years after all - but the new hood had it's mounting holes right on the inner edge of the molding which made using the same application impossible. The instructions described filling any under-cabinet recesses with furring strips to create a flush surface for mounting. 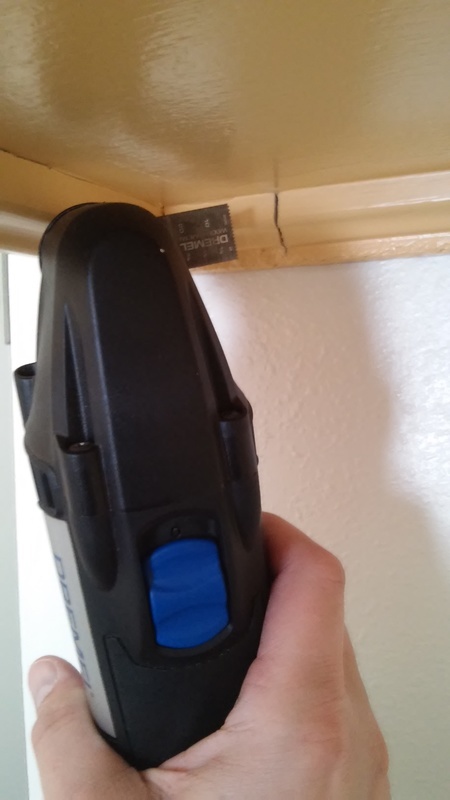 The problem was installing the strips with the molding in place meant that the mounting screws would land right in the crack between the molding and the furring. It was clear at this point that some of the molding would have to come out so the furring strips could be installed properly. 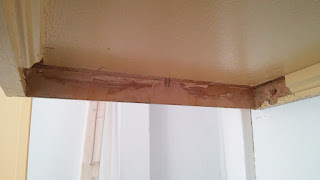 To remove the molding, I started things off with a plunge cut to the back molding using my oscillating dremel saw. I discovered this tool just a few months ago while working on some modifications to the staircase and hallway and it has proved invaluable for small, detail work like this. If you don't have one of these guys they're definitely worth the investment. I thought it would be easiest to start with the small end sections before tackling the longer strips on the sides of the cabinet. 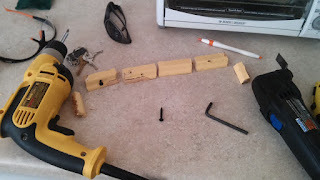 I was right - once I'd cut the sections free, the pieces popped out with just a little prying. Grab it by the screw! I figured that the source of my problem was that I didn't have any solid surfaces to use as leverage for the flatbar, so I decided to drive a short drywall screw into the molding and see if I could pull it free. Bracing the cabinet against the wall with one hand I gave it a few good tugs. Nothing seemed to be moving. I decided to go a little harder and tapped on the flatbar with my hammer. Still nothing. 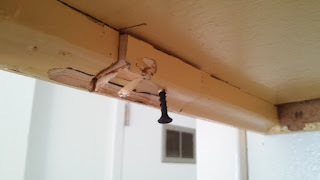 I turned the bar around so I could give it a good whack right next to the molding and pop, the screw ripped out of the wood and shot off somewhere near the refrigerator. Obviously my technique needed some improvement. A little frustrated and increasingly concerned with damaging the cabinets, I took a step back from the situation to pause and think about things. The short back sections had come out rather easily but these long side pieces just wouldn't budge. If only I could make them smaller and easier to remove...light bulb! I cut a small section out of the molding with a couple of plunge cuts, screwed another drywall screw into the piece, gave it a few more taps and voila, I was back in business. 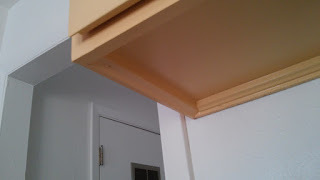 I worked my way down the length of the molding this way, taking it out one short section at a time. 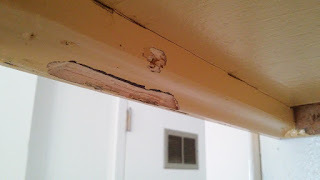 When I was done I could see that the molding had been glued in place and that removing it in one solid piece would never have worked. Definitely more time and effort than I had hoped for but the cabinet bottom was prepped and ready for the furring to be installed. My next challenge was finding furring strips with the right thickness. The recessed cavity under the cabinet was 1 1/16" deep. I would have been happy with some 1" material, but all the finished lumber dimensions come out to either 3/4" (when marked as 1") or 1 1/2" (when marked as 2"). After asking for strategies at Home Depot, I decided to start with a standard 2 x 4 board and plane it down to the thickness I needed with a belt sander. 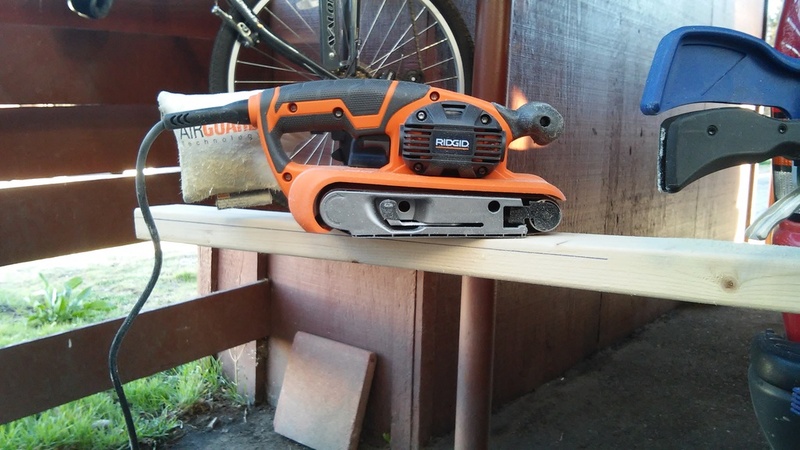 I didn't own a belt sander before this project and decided to buy one, knowing it would come in handy for many more jobs down the road. I drew a guideline by running a pen held to the end of a combination square the length of the board. The bright blue guideline measured out very accurately and I was proud to see that this technique I'd seen my dad use so many times had worked for me. I was lead to believe that sanding a soft 2 x 4 down 1/2" would only take a few swipes with a power sander. Yeah Home Depot guys...not sure the last time you tried this but it takes a bit more than that! I spent a good 20 to 30 minutes with an 80 grit sanding belt working down the wood. Yes, I could have gone back to the store to get a 40 grit belt but it was already getting late in the day and breaking my stride now meant I might just whimp out and call it a day when I got back. 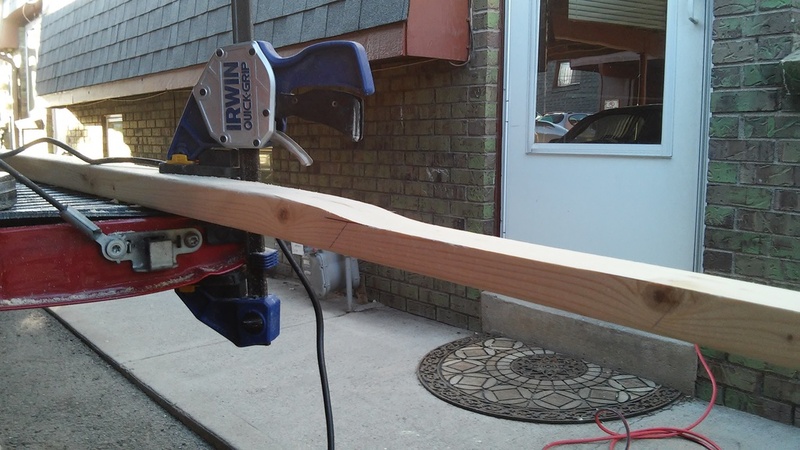 Planed down to 1 1/16"
So I pushed forward, running the sander with the "cruise control" trigger lock on, checking my depth against the guidelines on both sides, wondering how many people in the neighborhood were taking bets on how long this would take me. The little sawdust pouch had to be emptied four times before I was done but the belt held up well and the final product looked almost as good as if I'd used a planer instead. With the underside of the cabinet prepped and my furring strips cut to size, I was ready to put everything together. 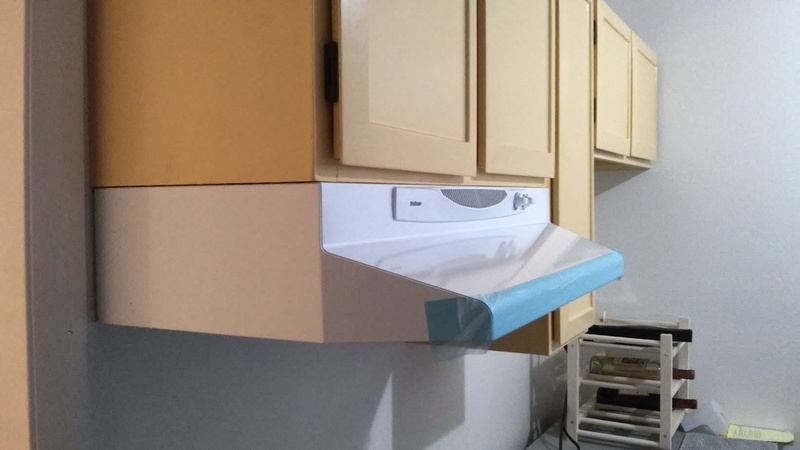 I wanted to avoid disturbing the painted surfaces of the cabinet so I decided to the glue the furring strips in place and staple them from underneath into the front and back panels of the cabinet. After that all I had left was to trace the mounting holes from the hood on to the furring, drill a few pilot holes, mount the electrical wiring to the back of the hood, and screw the hood into place. Overall I'm very happy with how the project came out, and even more happy to have one more item checked of my to-do list! I am planning to renovate my kitchen and this post has given me a great option for the cooking range hood. It looks really nice and beneficial and I will definitely get this one.